By placing a Millionaire bet from as little as €2, you’ll be getting the best value betting available on Europe’s biggest and most popular lottery draw that takes place every Tuesday and Friday night. That’s an incredible 25% saving on the cost of playing the EuroMillions lottery itself! Best of all, Lottolanders can take advantage of TONNES of fantastic features, such as DoubleJackpot, NumberShield and exclusive promotions you won’t find anywhere else! How does betting on Millionaire at Lottoland work? Betting on Millionaire on the Lottoland Mobile App or desktop site has so many benefits! Not only do you get the chance to win the same main game prizes, including the main jackpot, as though you’d played in the official EuroMillions draw, you also get incredible value and choice in how to bet and win big on the results of Europe’s most popular lottery. Choose 5 numbers from the main pool of 1–50 and 2 extra numbers from 1–12. You can also select the QuickPick option (Quick+1) and this will choose a random line of numbers for your bet. Once you have chosen your numbers, select which draw you want to bet on, either Tuesday or Friday, and press Submit. This will take you through to a checkout – at this stage just click Confirm and proceed to place your bet. How do I win the Millionaire Jackpot? You will win our Millionaire jackpot if your 5 main numbers and 2 extra numbers are the same as those in the official EuroMillions draw. See terms and conditions for details about jackpot sharing. Can I win all the same prizes betting on EuroMillions with Millionaire at Lottoland? You can win all of the same main game prizes betting on Millionaire with us as those available in the official EuroMillions draw, including the jackpot. A single line bet costs €2. A line with the DoubleJackpot feature costs €4. For more on DoubleJackpot please see below. Why does it cost €0.50 less to bet on Millionaire than it does to buy a ticket for the official draw? It costs €0.50 less to bet on the Millionaire at Lottoland than it does to buy a ticket for the official EuroMillions draw because our betting model gives us the freedom to set our own prices and offer our customers added value. The official EuroMillions jackpot is capped at €190 million. However, with Millionaire, you can select our DoubleJackpot feature for qualifying jackpots for the chance to win twice the official jackpot amount. See below for information on how this feature works. The DoubleJackpot feature on Millionaire allows you to bet for a payout of twice the official EuroMillions draw jackpot, for specific jackpot values. So, for instance, if the official draw jackpot is €80m and you bet on the outcome with Millionaire, selecting the DoubleJackpot feature for an additional stake, your potential prize would be €160m. The prizes for all other tiers will remain the same. It costs double the price of your normal Millionaire jackpot bet line to activate the feature. So, if you wish to bet on Millionaire with the DoubleJackpot feature you’ll pay €4, instead of €2. The official EuroMillions draw takes place every Tuesday and Friday night in Paris at approximately 8pm GMT. What are the odds of winning the Millionaire jackpot payout? The odds of winning the Millionaire jackpot payout are 1 in 139,838,160, the same as for the official EuroMillions jackpot draw. A breakdown of all the odds for each prize tier, together with estimated returns, is included below. The information below is provided as a guide only. Magic Million is an exciting scratchcard game, that’s available every time you bet on the Millionaire at Lottoland. Just tick the Magic Million box after picking your numbers and for just €0.50 extra you can take the chance to win €1 million! Plus, there are many more big money cash prizes up for grabs! Go the Millionaire betslip and for each line simply tick the Magic Million box after you’ve picked your numbers and, once you’ve paid, your Magic Million game will begin automatically. In order to win a cash prize you have to reveal three matching symbols. Magic Millions has a top prize of €1,000,000, and other prizes ranging from 25c all the way up to €100k! What are the chances of winning the top prize? The odds of winning the top prize on this scratchcard are 1 in 20,000,000. A full breakdown of all the prizes available for each tier, together with the odds of winning is included in the paytable below. A Magic Million game can only be purchased with a Millionaire bet and costs €0.50. If you successfully match three symbols a congratulations message will appear notifying of your win and the value. You can bet on the outcome of the draw right up until it takes place with LastMinute Tickets. LastMinute Tickets are available from 45 minutes before the official draw right up until the it takes place. Your LastMinute Ticket consists of 6 QuickPicks. Why should I bet on Millionaire at Lottoland? Because it’s better for the bettor! EuroMillions is Europe's most popular lottery and by betting on Millionaire at Lottoland, you can bet to win all of the same main game prizes from as little as €2. In addition to this, you can take advantage of a range of exclusive features such as DoubleJackpot, LastMinuteTickets, Subscriptions and JackpotHunt that you won't find anywhere else. If you're a new customer, we'll also give you your first line free. It’s win-win-win! What is the difference between the EuroMillions and EuroJackpot lotteries? Many people don't know, but EuroMillions has some stiff competition. There's a second big trans-national lottery, called EuroJackpot, which operates in Denmark, Estonia, Finland, Italy, the Netherlands, Slovenia and Spain, altogether encompassing a total population of 130 million inhabitants. The EuroMillions countries have a considerably larger population, at approximately 217 million inhabitants. From a gameplay perspective, the EuroMillions and EuroJackpot lotteries are similar; both lotteries require you to pick 5 numbers from 50, and 2 supplementary numbers. The supplementary numbers are where the difference becomes clear as you must pick 2 supplementary (Star) numbers from 8 for the EuroJackpot and for the EuroMillions you must pick 2 supplementary numbers from 11. The EuroJackpot organisers guarantee a weekly minimum jackpot of €10 million, with a maximum jackpot of €90 million. The EuroMillions is much larger in comparison, with a minimum of €15 million available at each of the two weekly draws (i.e. 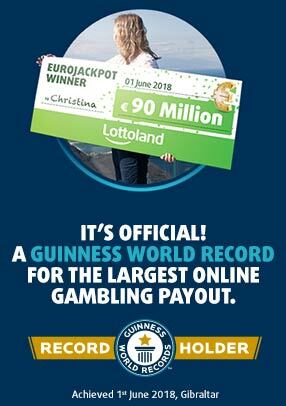 €30 million weekly), with a maximum jackpot size of a whopping €190 million! The winning numbers for the EuroJackpot are drawn every Friday in Helsinki (Finland), while the EuroMillions has two weekly draws on Tuesdays and Fridays in Paris (France). A great tip for Millionaire fans - whenever there's a Friday draw coming up with a low jackpot check out our EuroJackpot page, as it may well have a bigger jackpot, and at great odds too!